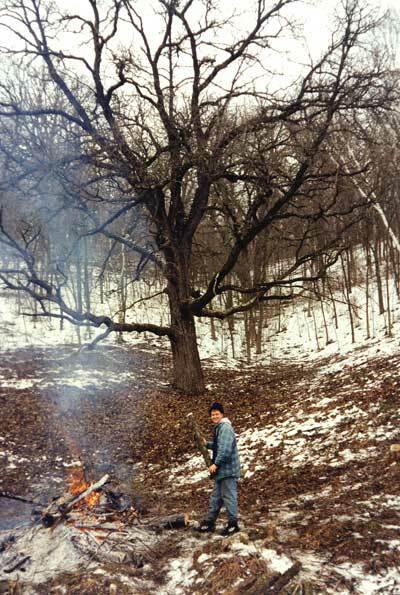 Oak savanna restoration involves a lot of delicate tree and brush removal. This is not logging, but careful work with chain saws and brush cutters. It is best carried out in the winter, preferably with a light snow cover so that brush piles can be burned without any problems. Because of the heavy work involved, clearing the savanna is usually a multiple-year job. It involves a lot of chain saw and brush cutter work. Some landowners are able to do this work themselves. If family members or friends are willing to volunteer, this sort of work can even become enjoyable. Another option is to hire part-time workers (perhaps students from a nearby University). If financial resources are available, a private contractor can be hired. It is important to hire a contractor who specializes in restoration work. 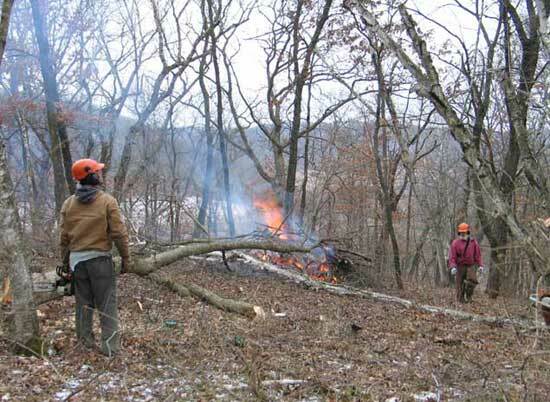 Most such contractors will permit the landowner to assist, and family members and friends might contribute by helping to burn brush piles or herbiciding cut stumps. A conventional logger is not recommended, even if the logger offers a substantial financial reward. Loggers have no appreciation for the delicacy of the woods and their approach is to get in and out as fast as possible, and leave all the cut uncommercial wood on the ground. Small logs and brush left lying will soon be infested with brambles, making further restoration very difficult. Whether the understory is to be created by interseeding or from scratch will depend on the size of the restoration, the extent of degradation, the funds available, etc. In any case, the critical item is the availability of a good seed mix of savanna understory species. A restoration should not be started until seeds are available. It is important to get the understory started right after clearing, before invasive shrubs or brambles from the seed bank start to flourish. When restoring a savanna, all trees should be removed that were not part of the original fire-dependent ecosystem. 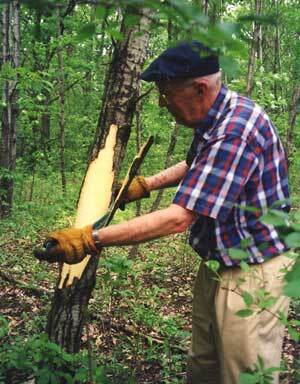 Woody shrubs should be removed at the same time as the trees. Tree species to remove include elm, black walnut, cherry, and box elder. Woody shrubs include buckthorn, honeysuckle, and prickly ash. If the site is a bur oak or white oak savanna, then black oaks that are crowding white or bur oaks should also be removed. (Black oaks are fast-growing trees that tend to grow into the canopies of the whites or burs.) Shagbark hickories can be left unless they are crowding white or bur oaks. The term "daylighting" is sometimes used to refer to the process of liberating open-grown oaks. In a degraded savanna, weedy trees or shrubs that are more shade tolerant generally grow up around the open-grown oaks and crowd them. The large lower branches of an open-grown oak get shaded and eventually killed. Careful cutting of the invading trees and shrubs should be done so that the lower branches of the open-grown oaks are not damaged. In some cases, the large lower branches may be still alive and begin to thrive again from the daylighting process. Daylighting a large open-grown oak. Before work began, this oak was almost invisible. However, the large lower branches were still alive and in subsequent years have leafed out, flowered, and set seed. A savanna restoration will result in a lot of downed wood. The good wood can be salvaged, either for use as fire wood or as lumber. It is unlikely that there will be a market for most of the wood. However, an area with a large amount of black walnut might be salvaged. Saw logs can be taken by cooperators with front-end loaders. Heavy equipment should not be used to remove logs, as this damages the understory. If the wood can be easily transported to a town or county road, local residents will quickly remove all this firewood. 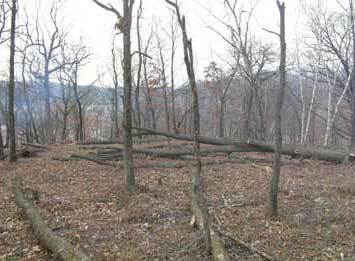 On a ridge top, if there is motor access, the wood can be removed by pickup truck. Since this may involve some off-road driving, it should only be done in the winter at snow-free times and the colder the better. Care should be taken to avoid making ruts. Frequent off-road driving over the same track should be avoided. Growth of savanna plants the following season should quickly hid whatever remaining ruts are present. 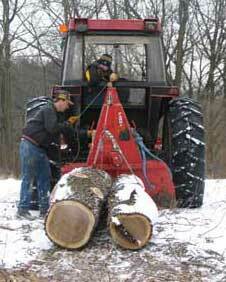 Use of a low-impact skidder to remove large logs. 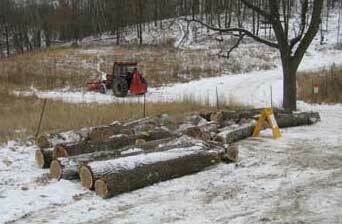 Cold weather and a thin layer of snow made it possible to skid logs without damaging the soil. Local residents who burn wood are always willing to truck away good-sized logs. This is strictly a barter transaction. If possible, the slash and small wood should be burned as it is cut. 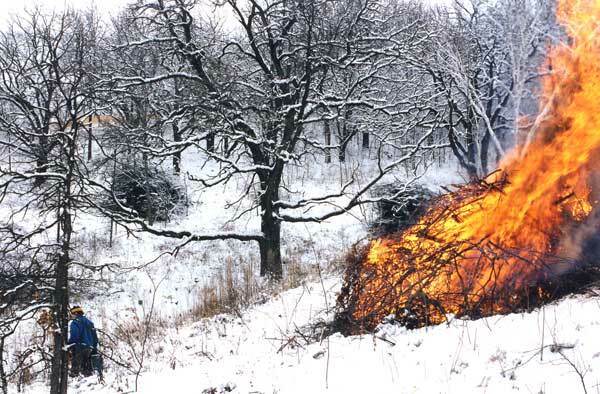 If it cannot be burned then it should be placed into large brush piles that can be burned when snow is present (see photo below). The fewer piles that are built the better, as the fire will sterilize the soil beneath. Some dead trees can be left standing as habitat for woodpeckers and other wildlife. Such dead trees can sometimes cause problems during controlled burns, but this risk may be accepted in the interest of creating desirable wildlife habitat. Standing dead trees can be fireproofed. Rare bird species such as red-headed woodpeckers prefer these trees for their nests. Clearing the savanna should begin at the most accessible site which has great oaks. A five-acre parcel of substantial open-grown oaks will make an excellent beginning. Such a site is large enough to have some good plants, to look great when cleared, and to serve as a learning tool. Understory restoration should proceed in parallel with clearing the trees and brush. There should be a good layer of oak leaves on the ground to serve as fuel and the restored area should be burned the same year it is cleared. Burning will open up the bare ground so that seeds of understory plants can germinate and grow. Planting should be carried out immediately after burning. Do not wait to plant for understory restoration, as it is essential to get “good” plants started before the brambles start to take over (which they surely will). Even if the budget permits restoration of more than five acres, it might be advisable to do only this small area first, in order to get a feel for the project. This slower pace of savanna clearing is also necessitated by the need to have seeds to plant in the cleared areas. Since it is advisable to use only local seeds, clearing has to continue in phase with seed collecting. Even if the manager feels confident in the work, it may still be preferable to clear only about 10-15 acres of savanna the first winter. Most degraded savannas will have become infested with both native and nonnative shrubs. This is primarily a result of lack of fire, which top-kills shrubs and keeps them from growing to large size. If the site was grazed, some shrubs may have been eaten, but thorny shrubs such as buckthorn and prickly ash are avoided by cattle. A decision should be made about what shrubs to cut. All exotic (nonnative) shrubs should be removed, but some restorationists prefer leaving some or all native shrubs. The principal native shrubs in the Midwest are hazel (Corylis americana), gray dogwood (Cornus racemosa), prickly ash (Xanthoxylum americanum) and two species of sumac (Rhus glabra and R. hirta). Hazel is attractive and forms nuts which are favorite wildlife food. Gray dogwood is attractive and beneficial to wildlife, but is quite invasive, and left unchecked will form large clones. Prickly ash is also clonal but less attractive, and a menace when walking in an open savanna. The two sumac species are also very invasive and should be removed. Check here for details of shrub removal. The cut stems of all shrubs should be treated with herbicide without fail. The herbicide of choice is triclopyr (Garlon 4) dissolved in oil and sprayed not only on the cut stem but down the sides of the stem (as a basal bark treatment). Glyphosate is effective on honeysuckle and gray dogwood but is not recommended for buckthorn or sumac. For that reason, triclopyr is the herbicide of choice because it is effective against all woody shrubs. See this link for details on control of invasive shrubs. A low-tech procedure for detailing with woody shrubs. Shown here for honeysuckle. Each stem is cut with a lopper and the cut surface treated with herbicide. The dye insures that all cut stems are treated. Procedure for spraying cut stems or basal bark spraying, using a backpack sprayer. A dye is used to ensure that all stems are treated. The shrubs that are cut can be burned at the same time the trees are being worked on, as seen in the photo at the top of this page. In fact, the branches of the cut shrubs can be used as the base for burn piles. Link to the fire section for a discussion of managing burn piles in a savanna restoration. Even if the site is relatively free of invasive shrubs, the restoration process leads to an increase in sunlight to the forest floor, which encourages the growth of shrubs. Brambles (various Rubus species) are especially prone to “take over” a restored savanna. There is always a seed bank of Rubus species, which are held back when the site was shady, but the increased sunlight after opening it up provides ideal conditions for bramble growth. 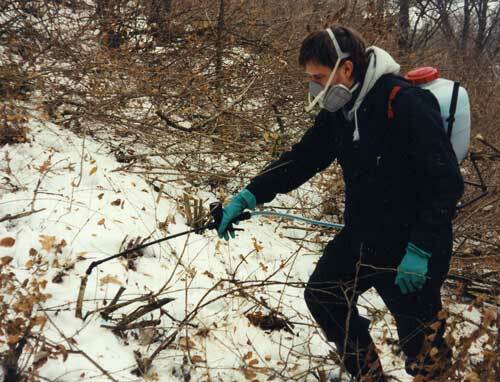 There is also an extensive seed bank of other invasive shrubs such as honeysuckle and buckthorn, as well as a seed bank of black walnuts and other fire-sensitive trees. The new growth of these invaders may be killed by fire but the rootstock will not be eliminated. Can burns be carried out without first removing woody vegetation? Burns can be carried out without removing the woody vegetation, but this is not advisable. A burn will top-kill existing woody vegetation, but will not eradicate it. Except for conifers, most woody vegetation that has been killed will resprout from the base, sending up new shoots the same or the following year. Right after the burn the savanna may look good, but this is only temporary. 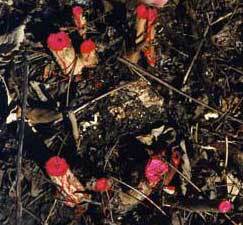 Unless one burns every year, the midstory woody plants will return, usually much thicker than they were. Since burns are much less expensive than cutting and herbicide treatment, there may be a temptation to do so. This is really false economy, because burns do not eradicate woody vegetation. Eventually, it will have to be cut, and cutting shrubs and trees that have been burned may be more difficult, because there will be numerous resprouts that will have to be dealt with. If funds are limited, it is advisable to work instead on a smaller area, doing it right and getting this area in good shape before moving on. Brock and Brock present a case study of the restoration of a small savanna. Sites that have not seen fire in a long time may have large aspen clones, which should be removed. Aspen are native trees but remain undesirable inhabitants of prairies and oak savannas. Aspen are capable of spreading rapidly and crowding out other vegetation. Aspen are pioneer trees on open , burned, or cut-over land. Although important economically in the paper industry, they are a menace in prairies and oak savannas. Aspen cannot be simply cut like other tree species, but must be girdled. There are two species of aspen that are native to these areas: trembling aspen (Populus tremuloides) and big-tooth aspen (Populus grandidenta). Trembling aspen is the most common, but both are bad and should be removed. It deserves emphasizing that clearing aspen is a very satisfying activity, as there very well might be “good” species underneath. Most of these aspen areas were originally prairie remnants, and many of the prairie plants may be able to continue maintaining populations for some years after the aspens have started to take over. Even if the aspen clone is very dense and there is too much shade for satisfactory growth, good species in suppressed form may be present. It is advisable to work hard to get rid of these trees. An aspen clone is easy to spot in the fall of the year. Although aspens grow from seeds, the primary spread is asexual by underground rhizomes. The typical aspen "grove" is a multi-stemmed clone in which all the roots are interconnected. If an injury to a stem or root occurs, there will be a rapid response by the clone, and new shoots ("suckers") will be sent up all over the area. New shoots have been known to arise as far as 50 feet from the nearest aspen tree! The clone may expand simultaneously in several directions, as influenced by environmental conditions. In western United States, huge aspen clones have been found, the largest occupying over 100 acres. In our part of the country, aspen clones are smaller, but are often more than an acre in extent. An area where all the aspens had been removed by a commercial logger. Massive resprouts have occurred from the dormant buds of this clone. 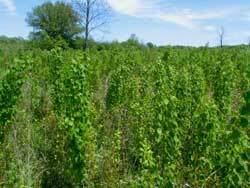 Aspen clones are widespread in the Driftless area of southwestern Wisconsin, eastern Iowa, southeastern Minnesota, and northwestern Illinois. They are easy to spot in spring when the light green leaves first appear, and in the fall, when the leaves take on their distinctive fall color. Virtually every woodlot in some areas has at least one or more aspen clones. This was not always the case. In earlier times, aspens were uncommon. This was because aspens are fire-sensitive, and when prairie and savanna fires were widespread, they were held in check. When looking at a large aspen clone, it may be tempting to go in with a chain saw and cut it down. Wrong! The roots remain alive and immediately send up a huge number of new shoots. An area that had perhaps 5 or 10 large aspen trees will soon have hundreds of aspen stems. This is one of many reasons why a commercial logger should not be allowed on the property. Girdling means stripping a layer of bark and the underlying cambium and phloem in a band around the trunk. The phloem vessels translocate sugars and other nutrients to the roots, so if the phloem tubes are broken, the roots become starved of food. The xylem vessels, which translocate water to the leaves, are not affected by girdling. With girdling, the upper part of the tree still remains alive, since photosynthesis can continue. Eventually, however, the roots die, and the whole tree dies. The first year after girdling, the clone may appear almost normal, but by the second year the clone usually dies. The dead trunks can then be cut without stimulating resprouting. For girdling to be affective the whole clone must be treated. It is also important to make the girdle in such a way that the underlying xylem is not damaged. Damage to the xylem sends signals to the tree that something bad has happened, and the tree then sends up shoots. The photo demonstrates the technique of girdling. Girdling is done in May or early June when the sap is running fast and the tree is growing. At that time, the bark can be easily cut and the girdled bark stripped off. Later in the summer, it is virtually impossible to do a girdle properly. Technique of aspen girdling. The tool was made from a leaf spring of a truck, sharpened on one side. The bark is cut with the sharp side and then peeled off by walking around the tree. Even large aspens can be girdled in this way. The best time of year to girdle is when the sap is running, usually in May or early June. It is important that every tree in the clone be girdled. Some large clones can have over a hundred trees. An experienced worker can girdle 100-200 trees in a day. It takes about two years for the trees to die, and they should not be cut until that has happened. The dead trees are then cut, stacked, and burned. Although girdling is very effective, small aspen resprouts may still come up at the edge of girdled areas. These can be handled by cutting with a hand clippers, loppers, or brush cutter and treating the cut stems with triclopyr. One of the invasive tree species that comes into degraded, neglected oak savannas is black walnut (Juglans niger). This species is fire sensitive and was not present in original oak savannas. It grows relatively rapidly and is able to take over any open areas. Black walnut was originally only a minor component of oak savannas and oak woodlands. Because its wood is a fine straight-grained wood, it is highly prized, and there is usually a market for it. Black walnut is intolerant of shade and it must be a dominant or co-dominant in order to survive. Black walnut is primarily a tree of the mid-continent of the United States and is at the northern edge of its range in southern Wisconsin and Minnesota. Although it occurs throughout Iowa, it occurs only in the eastern half of Missouri, is absent from the Dakotas, and is virtually absent from Nebraska. In most forest situations, it is usually found in mixed forests as single isolated specimens, although in some restricted areas it may become dominant or subdominant. Black walnut produces a toxic substance called juglone (5-hydroxy-1,4-napthoquinone), which occurs in all parts of the black walnut plant. Juglone inhibits the growth of many other plants, a phenomenon called allelopathy. A mature tree can have a toxic zone of 50-80 feet in radius from its trunk. Members of the genus Quercus have been reported to be sensitive to juglone, which suggests that oaks might be pushed out once black walnut becomes established. The toxic area affected extends outward each year as a tree enlarges. However, tests have shown that some native plants are resistant to juglone and are thus able to grow in the presence of black walnuts. Resistant plants include all grasses, and a number of woodland forbs, including jack-in-the-pulpit, bellflower, bellwort, dutchman's breeches, wild geranium, mayapple, solomon's seal, bloodroot, and trillium. Also, spiderwort, a common prairie plant, is resistant to juglone. Honeysuckle, an invasive shrub, is also resistant. Lists of native plant species resistant to juglone can usually be obtained from the County Agricultural Agent, since juglone toxicity has horticultural implications. Obviously, black walnut is not a tree that one would want to have in a restored savanna. As part of the oak savanna restoration, all black walnut trees should be removed. Although black walnut is considered a cash crop in forestry, in the oak savanna it is an invasive species. Trees large enough to be used as saw logs can be saved and marketed, or donated to a nonprofit group for a tax deduction. If the walnut infestation is extensive, their removal may leave behind a handsome stand of mature bur oaks that have survived years of grazing pressure. A black walnut infestation. Some of the logs in this area were large enough to convert to lumber. Black walnut is a desirable lumber wood. If good logs can be skidded to a road a sawmill can often be contracted to pick them up, perhaps with no charge. The cut surface of a walnut trunk usually exudes a large amount of a nutrient-rich fluid, which supports heavy mold growth. Because of the upward flow of this fluid, penetration of herbicides may be restricted. To prevent resprouting, herbicide treatment of the cut stump with triclopyr followed by basal bark treatment of the remaining trunk is recommended. When dissolved in an oil, this herbicide has strong ability to penetrate the bark and be translocated to the roots. Even with this harsh treatment, the stump may still resprout. Walnuts are notoriously vigorous resprouters and the cut stumps must be monitored for several years following tree removal. If the stumps do resprout, the best procedure is to cut all new growth with a brush cutter and repeat the triclopyr/cut stem/basal bark treatment. In addition to the resprout problem, there will usually be an extensive seed bank, since walnuts are prolific seed producers. Most of these seedlings will be difficult to find until they have had several years growth. Monitoring in the third or fourth year after clearing is recommended, and all walnut saplings treated by basal bark with triclopyr alone. Alternatively, the young tree can be cut the a brush cutter or chain saw followed by triclopyr basal bark treatment. Restoration work of the kind described here is expensive. Costs in the 1990s and early 2000s ran between $3000 and $5000 per acre. These costs were for an experienced crew who worked very efficiently, and included cutting of trees and brush, stacking and burning, and all herbicide treatment of cut stems. 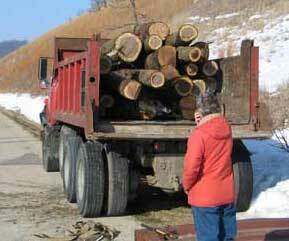 It did not include the cost of removal of firewood except where the wood could removed free by local residents. Despite the cost, oak savanna restoration is a vital activity to carry out. As noted, the oak savanna habitat is globally endangered and is probably one of the rarest vegetation types in the world. Because of its broad value for wildlife and esthetics, its restoration should be a high priority mission, and well worthy of much more governmental support.